Yaz. (2 evolutions in all). On its last evolution : Uncommon. Sap Heart. Warrior. Hom'Chai. Spirit 0. Attack 7/10. Defense 4. Health points 16. 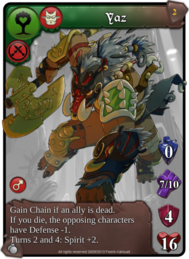 Gain Chain if an ally is dead. If you die, the opposing characters have Defense -1. Turns 2 and 4: Spirit +2. Amber Pebble. Uncommon. Other. Sap Heart. Duration 3 fights. 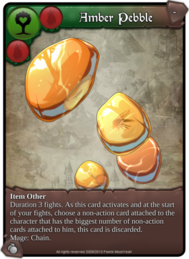 As this card activates and at the start of your fights, choose a non-action card attached to the character that has the biggest number of non-action cards attached to him, this card is discarded. Mage: Chain. Touché!. Uncommon. Action. For each Weapon attached to your characters, one opposing Action or Spell attached to one of them is discarded. Holy Effigy. Common. Jewel. Duration 2 fights. Attack +1 per Elfine and Defense +1 per Hom'Chai. 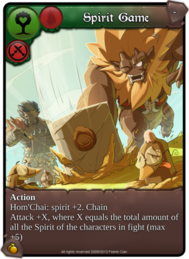 Your Hom'Chais gain Chain Item. Hornet cloud. Common. Nature. Sap Heart. Mage. You opponent has Spirit -2. Mage: one "Magic Poison" is created and played if your opponent doesn't have any "Magic Poison" attached to him. Zilinak Statuette. Common. Jewel. Duration 2 turns. Defense +2, all the characters are tapped. At the end of every turn, an opposing character and one of your characters are untapped. Chain. Edit: With this news, we want to take opportunity to announce the following change: - We have modified the Newcomers Booster (in store and in the Champion arena) in order to avoid duplicate cards in the Booster.